Mayor Martin Walsh addressed real estate executives at the Boston Convention and Exhibition Center. 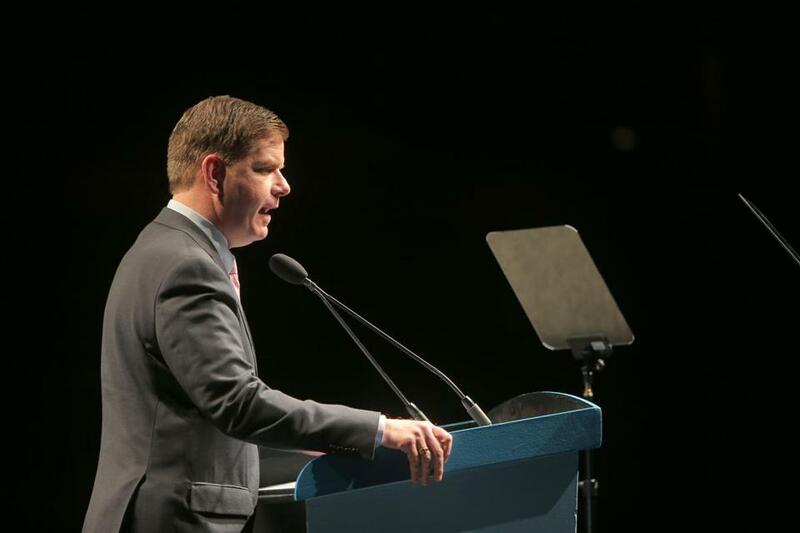 Mayor Martin J. Walsh said Thursday that he will introduce a “new era of transparency” in pursuing business growth in Boston that will require a major overhaul of the city’s primary economic development agencies in the months ahead. In remarks before hundreds of real estate executives, Walsh promised that his planned reforms will not interfere with a period of strong construction activity in the city. He said he will aggressively recruit new businesses and building projects. Shortly after his remarks, the Boston Redevelopment Authority approved its first massive development under Walsh -- an expansion of the Landmark Center complex near Fenway Park that will bring in a Wegmans supermarket, 550 apartments, and a new public park. The parking lot at the Landmark Center is going to be converted into a public park. The approval extends the string of large-scale developments approved in the waning months of former Mayor Thomas M. Menino’s final term in office. Without mentioning Menino by name, Walsh lauded the city’s economic growth, noting that it ranks fourth nationally in the amount of commercial space under construction downtown. In a light-hearted aside, he even said he hopes to double the current amount of construction activity during the next few years. As he lauded the growth under Menino, Walsh made clear he would overhaul the development agency that many have criticized as too powerful and too secretive under the former mayor. Menino was often accused of giving tax breaks and other special advantages to a select group of developers and builders. Critics said projects proposed by those out of favor with the mayor often languished before the BRA. During the mayoral campaign, Walsh was by far the most aggressive candidate in promising to reform the BRA. He argued that the authority’s process of reviewing developments needed to become more open and predictable for developers and ordinary residents alike. Many developers had been concerned Walsh’s plans would interrupt a robust period of real estate activity and economic growth. But the mayor’s comments Thursday were greeted with enthusiastic applause. In an interview after his formal remarks, Walsh said he has asked interim BRA director Brian Golden, a holdover from the Menino administration, to review his 14-point plan for overhauling the agency and help determine which reforms can be implemented in the short term. The new mayor has proposed a wide range of changes, including the creation of an economic development agency that would oversee planning and development functions now managed entirely by the BRA. That agency would be led by a secretary working under a contract and have greater independence from the mayor’s office. The plan also proposes to grant more oversight of planning and development to the city council, and to create an entity focused primarily on residential and commercial development in Boston neighborhoods from East Boston to Roxbury to Charlestown. Walsh has acknowledged that many of the structural changes to the BRA would require approval from the State Legislature, which originally created the agency in 1957 to help revitalize the city’s then-struggling downtown. Walsh sought to reassure real estate investors and developers Thursday that city’s review process will continue to function normally while reforms are under consideration. “I am here to tell you that Boston is open for business and growth is going forward,” he said during the event, which was an overview of the city’s commercial real estate market by the firm Colliers International. Walsh said he is currently undertaking a detailed audit of the BRA’s operations that will also help him determine how to refine the city’s planning and development functions in the months ahead. The audit will examine how development projects are reviewed and amended, and how they are vetted in neighborhoods that stand to be impacted by construction of new commercial and residential buildings. He noted that the BRA meeting agendas — along with project proposal themselves — often change abruptly with little notice to stakeholders. Walsh also said he will determine whether to add to or overhaul the BRA’s staff to improve efficiency and clarity. “One of the concerns or complaints we hear a lot is making sure we have people up there that understand the financing of deals, so that as we make changes on a particular plan what are the implications toward the finances,” Walsh said. He has several decisions to make soon on the BRA’s top management. For example, he will have to decided whether to keep Golden as its interim director, or to appoint someone new to oversee the agency while he vets candidates to become the permanent director. Walsh said he will soon move to fill a vacancy on the BRA board of directors that opened after Clarence “Jeep” Jones stepped down near the end of Menino’s term. He also said he will consider whether to replace or reappoint board members Paul Foster and Consuelo Gonzales-Thornell, who continue to serve on the board even though their terms have expired.